On Friday, the Wall Street Journal reported that ” people familiar with the NSA’s operations said the initiative also encompasses phone call data from AT&T…and Sprint Nextel records from Internet-service providers and purchase information from credit-card providers.” Sensing a good fight, the group called Anonymous has jumped in as well, posting online what appear to be 13 secret U.S. documents that suggest data gathered through PRISM is being shared with the NSA’s “intelligence partners” – meaning the security and intelligence services of other governments. “Is it just me, or is secret blanket surveillance obscenely outrageous?” tweeted former presidential candidate Al Gore. Judging by the outrage across social media platforms this week, the answer would be no. 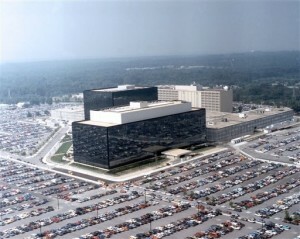 However, for much of its history the NSA has been limited to collecting foreign communications only. Domestic surveillance strictly illegal. To ensure compliance, in 1978 Congress passed the “Foreign Intelligence Surveillance Act”, which in turn created a secret FISC, or Foreign Intelligence Surveillance Court, that the NSA would have to appear before anytime it wanted a warrant to monitor domestic communications. The idea was that the court would provide strict privacy protection for U.S. citizens. In practice — perhaps because all its actions are secret and that only the government may appear before the court, or because the very nature of Internet traffic knows no national boundaries — the FISC court has been unusually compliant with the NSA’s requests. For example, between 2010 and 2012, the FISC approved all of the NSA’s 5,180 surveillance requests. For his part, U.S. National Director of Intelligence James Clapper has confirmed the existence of PRISM and decried the leaks as “reprehensible,” saying, “The unauthorized disclosure of a top-secret U.S. court document threatens potentially long-lasting and irreversible harm to our ability to identify and respond to the many threats facing our nation.” The nine Internet companies named by the Washington Post have issued either non-committal statements, or outright denied any knowledge of PRISM. It’s likely that shortly after Alexander Graham Bell told assistant Thomas Watson, “I need you,” telephones have been tapped. With it’s hard-wired person-to-person structure, it has aided countless investigations. The Internet, however, is another matter. The phone monitoring is somewhat different, and not really phone tapping. The FISC order in the Verizon matter strictly limits surveillance to “meta-data” — that is, the time, duration and recipient of a phone call, but not the actual communication itself. By sorting through these many millions of data points, intelligence analysts are looking for patterns in the noise that may provide crucial clues about the identity and location of potential terrorists. Another easily overlooked facet to these stories is that the very firms – like Apple, PalTalk or AOL – that people are using to chat and share online are themselves mining their data stores for their own corporate gains. While some companies like Facebook and Google provide “privacy tools” that allow users to restrict personal data sharing, each firm admits to using private data to tailor services to customers, or selling it to other firms hoping to, say, better target their online advertising. Still, all that may be cold comfort to people like Digital First Media’s Mandy Jones, who tweeted, “I shudder to think of what the NSA is doing with those drunk photos I thought were safely hidden on Facebook.” [Ed. note: As we’ve repeatedly told you, there is nothing hidden on Facebook.] While both Republican and Democratic members on Capitol Hill have been briefed on these, and likely other, NSA programs, they were limited in what they could say or object to by the FISC’s classified nature. More congressional debate can be expected. In the meantime, amid memories of the 2005 revelations of the Bush administration’s “warrantless wiretapping” program, and the current swirl of stories about tax agency over-reach and the Justice Department’s broad seizure of AP journalists’ phone records, worries about the NSA’s surveillance of all people – foreign and domestic – will only grow. Until then, it’s worth remembering that there is very little that’s completely private in these digital times. Before pulling a quote from Twitter, I’d recommend checking the name and bio info. Also a good idea: Noting if the person sending said tweet was being facetious. I know Mandy. I knew that was facetious when I read it. Do you really want to go to “I thought” when you’re caught doing lazy reporting? You didn’t even get her name right! This is the time for a mea culpa, not trying to tell Mandy you really know she wasn’t being facetious. There is not one single free email service or cell phone company, which would not try to racketeer your personal information one way or the other. Free email services also use use the cloud, and that puts everyone in danger from hackers. Why so many people fall for the ‘free’ internet services is beyond me. YOU ARE THE PRODUCT!! Go ahead and spend your 5 bucks on your daily latte or cappuccino and cheap out not spending 10 or 20 bucks a year on a private secure encrypted email service..
My family all use private and secure email services including hush mail and my-edu-email.com for privacy and professionalism. And I never even get spam anymore since I stopped using free email services like gmail who spam you with advertisements by filtering keywords in your email text. BOYCOTT ALL CORPORATE FREE EMAIL SERVICES AND FACEBOOK!! Hit the corporations where it hurts, stop using them in protest! I did this years ago and no looking back to corporate internet spyware services! Spying and eveasdropping has been going on for a long time, just that the interent is so open to acess, even by teenageers hacking websites for fun. So have there been mass arrests of wanted criminals/ wanted terrorists? missing persons? Not likely. The more the systems are going high-tech,the higher the crime index is soaring.The PRISM is doing good job;NSA is doing good job.But none ought to be adversely victimized.This is because God is going super-high-tech over global high-tech system.